If you can’t forecast your sales, it’s really hard to make good business decisions. Do I need to hire more people? How much space do I need? Should I invest in this new software? We can only answer those questions if we can predict our future sales. A lot of business owners have sleepless nights trying to guess the answers to those questions. Not knowing what the future holds causes a lot of worry. On the other hand, if we can accurately guess at our future sales, then the right decision is just simple math. If you can’t forecast your income, then you aren’t in control of it. If there isn’t something you’re doing proactively that causes sales, then you don’t have a way to increase revenue when a project gets canceled. You will always be left scrambling, trying to cover expenses when the income suddenly dries up. And you better be sitting on a large cash reserve to make it through those times. When I stand back and look at what’s causing these unexpected fluctuations in income, it’s usually some place we’ve let the client get in control of the project — and that’s bad. If they are in control, then you aren’t in control of your success or your income. What are some steps you can take to get in control of your projects and your income? 1. Get paid regularly, based on things you are in 100% control of. For those of you who work on “projects” (e.g. set fees for certain deliverables), don’t set payment terms based on milestones. How many times have you done all you can to reach a milestone only to have the client not do their part? Instead, set payment terms based on time intervals. If they haven’t made it to the milestone in 60 days, they are getting billed anyway. You’ve set the deadline so that if they got their part in on time, you’d make the milestone easily (but they won’t 90% of the time at least). It encourages them to get their part done and puts money in your pocket on a regular basis. If you are getting paid for “hours worked”, that can also be a trap. If a client suddenly slows down, does that leave a hole in your schedule? If you can easily switch to another project (and you let the slow client know they lost their priority) then great. But if not, you need a way to recoup those hours. You need deadlines with consequences to keep things on track (see below)! 2. Set deadlines (and stick to them). Ideally, you would to be in control of everything you need to successfully complete a project. But that’s not always the case. We need approvals, input from the client, content or other work product from them, and we usually end up waiting for that. While we wait, our resources are idle (or at least their productivity is reduced). If we set deadlines (“I need to get your approval on this design by next Friday.”) then we can plan and be more in control. But what are the consequences for the client if they miss that deadline? If there aren’t any, they will miss it! Oh, and nagging phone calls, irritated emails, and your stress and disappointment are usually not enough of a consequence to get them to meet the deadline! Project Delay: If the deadline is missed, they lose their place in line. We will get back to the project once the next project is completed. The important thing about these consequences is that they communicate to the client that you are in charge of the project. That they need to keep on your schedule. It sets a balance of power that’s in your favor. You are back in control. 3. Generate more leads every month. This is the lynchpin. If you don’t generate leads regularly keeping a balance of power in your favor is just too hard. Staying in control means you might disappoint your client or you are going to cause them stress. It can be hard for service firm professionals to do that — we want to serve our clients; we want them to be happy. I mean, if they aren’t happy — they might leave! If your primary concern is not losing the client, then you will not be in control of your cash flow. What keeps you from being afraid of losing the client is having a strong pipeline of new clients coming in the door. Marketing makes this possible. If you have confidence that there are new clients banging on your front door, then it’s OK if a client who doesn’t respect your time walks out the back door. You need to develop a consistent marketing program that produces a regular flow of new business leads. You need to execute this marketing program in good times, and in bad times. When you are swamped (but remember those projects could cancel at any time) or when you are lean. If you know you can proactively take action that produces new projects, then you will have the courage to hold your clients to their commitments and deadlines (whether they like it or not). If you fail to keep consistent in your marketing and you can’t keep your pipeline full, then you will fear losing clients. You will lose control and instead they will control you. Having a predictable cash flow, billings you can count on month after month, makes running your business so much easier. 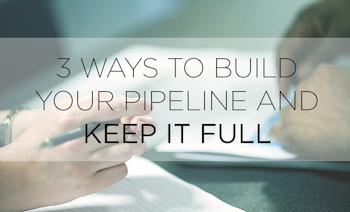 There’s things you can do to make that happen, but they all depend on developing that consistent marketing pipeline.